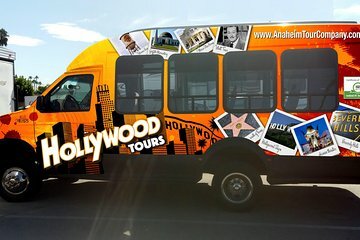 Visitez six attractions populaires d'Hollywood et de Los Angeles lors d'une excursion en bus d'une journée complète au départ d'Anaheim. Prenez le temps d'aller au théâtre chinois sur Hollywood Boulevard et de vous promener le long du Walk of Fame d'Hollywood, puis dirigez-vous vers Rodeo Drive à Beverly Hills, suivi de la jetée de Santa Monica et de Venice Beach. Vous avez également une heure de temps libre pour acheter votre déjeuner et explorer The Grove et The Original Farmers Market. Comprend un guide, des commentaires en direct, le transport par autobus de 24 passagers, ainsi que la prise en charge et le retour à l'hôtel. Had an amazing time on this trip in the summer. We were picked up on time from our hotel and were in a small minibus group, so was a small informal tour. The tour guide was fantastic, she was so friendly and approachable. All of the sights that we saw were amazing, we particularly enjoyed the beaches. A really great way to see these sights if you are visiting Disneyland and don't have transport to get around CA but want to see a few sights that don't involve Mickey Mouse! Pick up was exactly on time and our driver/guide was excellent. Was very informative along the whole trip. Enjoyed our day. Our trip was OK. We saw the sights that we were told we would see. The only negative was our guide. She answered all the questions that we asked and was pleasant. The problem was that you had to ask. Often I wanted to know where we were and some information about the sights we were seeing. I didnt want to keep asking questions. More history and information would have been appreciated.